As summer lingers, and weather permitting our garden seating remains fully open for lunch and dinner! Come down and join us for a fabulous meal in a fabulous setting…AT DOMO! A few days ago I was watching public Japanese television when a documentary came on with information that surprised me. The subject of the documentary was global waste and the facts revealed caused me pause. I learned that in the United States, the cost of edible foods discarded by restaurants and food preparation operations neared 4 billion a year; a sizable amount of money and resources that were wasted every year. This was only the beginning however. The documentary went on to explain that Japan wasted over 11 billion dollars worth of food with a population of only about one third that of the United States. When Domo first opened, we used to serve Domo’s signature side dishes in individual trays for each customer. It wasn’t long however, that I noticed how much food was being wasted. By serving the side dishes individually, if a customer did not like a particular side dish, they would not touch it, and inevitably it would be thrown away. Especially for business dinners or other formal gatherings, people hesitated to lean over to their dining companion’s tray and ask if they could eat their leftovers! While other Japanese restaurants serve their side dishes a la carte off their menus for a price, Domo has always included its famous country side dishes with every lunch and dinner. We considered creating a system where customers could choose which side dishes they would like served with their entrée but two problems presented themselves in this approach. First, Domo makes up to 15 side dishes fresh every day and the menu changes daily and seasonally so offering presentable descriptions of each side dish available daily would be a bit overwhelming. The second problem was that most of our Domo customers are unfamiliar with many of the ingredients, so selecting side dishes would not only be time consuming, it would be laborious for both customers and staff. Since Domo’s side dishes have always been included with the meals served, it was not as much a financial loss, it was the waste of the food itself that bothered me. The international humanitarian projects I have been involved with in AHAN (The Aikido Humanitarian Active Network) have taken me to many countries where I have experienced firsthand the lives of people who have nothing to eat at all. I have seen that misery, and those experiences have left an impression on me that I cannot forget. To see food wasted in my own restaurant was hard on my heart and conscience. We decided to introduce a “family-style” service for Domo’s side dishes which is not a common practice in Japanese restaurants. Now at Domo, our country side dishes are served separately from the main courses in larger portions relative to the number of diners at the table. Our customers are invited to sample and enjoy what they would like to try, each to his or her own tastes and favorites. We have found that this way we save a tremendous amount of food over serving individual portions on individual trays. It also creates more of a “home style” family atmosphere for everyone to share! Another change we have made is to serve our entrée’s over rice instead of the customary Japanese practice of serving rice on the side in a rice bowl. This service seems more comfortable for our American clientele (especially when using chopsticks) and has also saved a lot of rice from being wasted and discarded. Some might complain that our service style is not “Japanese”, but our customers that have been to Japan, can appreciate that Domo’s serving style is typical of Japanese meals served at home. So Domo has chosen to save our resources instead of serving tiny portions of foods on large decorative plates or on tiny china dishes. We think our choice offers more room to concentrate on the quality and creative of the foods we serve at Domo and it also has helped save money in the number of plates broken! Where we use to budget at least $5000 per year to replace broken dishes, we are now down to a “dish budget” of about $1,000. At Domo we have much better ideas on what to do with the money saved. Domo Restaurant has long been involved with humanitarian projects and this year’s “Dine at Domo and Feed the World” campaign has been very successful, thanks to the support and understanding of our customers. Domo currently helps deliver over 2 tons of rice in Asian countries every month, and right here at home, Domo has served an average of 300 meals every month for the last 19 years. For detailed information on our “Dine at Domo and Feed the World” Campaign and photo gallery, click on the links. Last spring, Domo was the first restaurant in Denver to discontinue the use Kihada Maguro tuna after it was added to the world endangered species list. A popular fish in sushi bars, Kihada maguro has been severely over-fished over the years, depleting the world population of this species of tuna to dangerous levels. Domo replaced Kihada Maguro on our menu with Vintoro or Vincho Maguro (White Albacore Tuna), which is plentiful, economical and quite delicious! At the time, a few of our sushi gourmet clients were a little surprised and not that happy that we had discontinued Kihada Maguro tuna from our menu. In recent months however, for REAL sushi gourmets, it has been all the rage to boycott sushi bars that serve any fish or shellfish that might be endangered. Hollywood has even joined the campaign and Hollywood stars have gone public, contributing to the growing popularity of this new cause. As owner of Domo Restaurant, I will do what I can to save and not waste food or further the depletion of any endangered species, but it takes the support and understanding of our customers to accomplish these goals. For this support I am grateful, and am very happy that our conservation of resources has resulted in the support of projects to feed those in need, not only here in Denver but in many parts of the world. For more information on AHAN and its humanitarian service world-wide, click here. 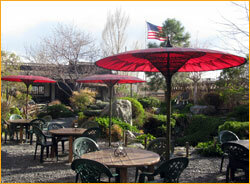 All of our customers love the Domo gardens for lunch and dinner. Our garden is completely natural and we do not use chemical fertilizers or pesticides in our garden maintenance. For this reason, the Domo garden is visited regularly by birds, dragon flies, butterflies and other friendly insects. Unfortunately we are also visited occasionally by flies. One evening we had a customer that insisted on sending their entire meal back to the kitchen because a fly made a touch and go landing on their plate. We considered thoughtfully on what to do. We can’t cover the entire garden with netting, nor would it be healthy or feasible to spray the entire garden effectively with insect repellent. The only solution we concluded was that if you are adverse to an occasional visit by a fly that you dine inside, instead of out on the Domo garden patio. The only other condition in the Domo gardens that we have little control over is the weather, and if there is a sudden downpour on a busy night, it is very difficult for us to guarantee that emergency indoor seating will be available. This risk is seldom realized, but it is best to understand the possibility. We try our best to address all of these concerns and protect Mother Nature as well as our human family. Dining at Domo will give you not only a delicious meal in a unique and award winning setting, your patronage also helps in our own small way to serve our world, and extend the hearts and generosity of all of our customers at Domo. Domo’s new Spicy Vitoro Maguro Donburi and Daikon Vintoro Maguro Donburi have been very popular this summer. This white Albacore tuna has a rich taste and texture similar to Maguro Fatty tuna and makes a delicious entrée event. Domo uses it’s own original marinades for the Vintoro Maguro sashimi that is served over rice. A great value for a great price and for those in a hurry, these dishes are prepared quickly. 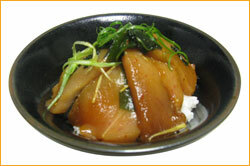 Take out for all sashimi donburi is not available during the hot summer months. Domo also is serving somen noodles, a popular summer favorite in Japan as a side dish for our lunch entrée’s. Enjoy! Fresh albacore tuna sashimi, with fresh ginger, wakame seaweed, scallions and Domo’s spicy chili sauce dressing. Served over sushi rice.